across TV, radio and print. The biggest spender is Clive Palmer’s United Australia Party, last week passing the $30 million mark. Here’s a wrap of the best federal election initiatives. Keep an eye on this page as we’ll be updating it regularly. Isobar Australia and behavioural change agency Cox Inall Change have collaborated with Australian Futures Project and Roy Morgan to create The Perfect Candidate. The data-generated virtual candidate contrasts people’s issues of concern against the major political parties and sitting candidates in federal electorates. Designed to address the frustrations many Australians have towards modern politics, it uses the data and insights of more than 125,000 Australians. It also allows you to see how concerns vary across state, region, age and gender. 30 months of data collected since the last election from Roy Morgan was mapped against policy statements on the websites of the political parties and independents, alongside analysis from the Australian Futures Project. Isobar built the overall concept of The Perfect Candidate including creating the website. “The Perfect Candidate is the first-ever digital candidate that was designed to disrupt and change the conversation during the election campaign, giving a voice to the concerns of Australians," Cox Inall Challenge general manager Justine Sywak says. 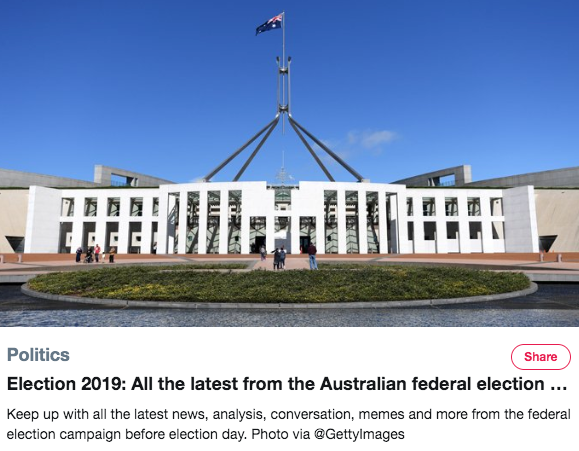 As Australia prepares to go to the polls, they are taking to Twitter to discuss the political issues, topics and candidates that matter most to them. Twitter says this is no surprise, considering #Auspol has been the most tweeted hashtag in the nation for five years - "longer than a term in parliament". As part of the lead up to the election, Twitter has created a special event page that will aggregate and update all the most recent and relevant election-related tweets. The social media platform is also celebrating the "democracy sausage", which are sold at most voting booths across the nation, with an emoji that will appear any time a user tweets with the hashtags, #AusVotes, #AusVotes2019, #Auspol, #AusVotes19, #DemocracySausage and #SausageSizzle. The Sydney Morning Herald and The Age have launched an election version of their marketing campaign, You Deserve to Know, as their editorial teams gear up for the federal election. Initially launched in February, You Deserve to Know builds on the “Independent Always” ethos of the Herald and The Age by highlighting cases of public interest journalism where they have led the national conversation. This next stage of the campaign highlights the role both papers have played in helping the public "make sense of the policies, spin and soundbites" before casting their vote. Over five weeks, the campaign runs across print, digital display, out of home and social media. 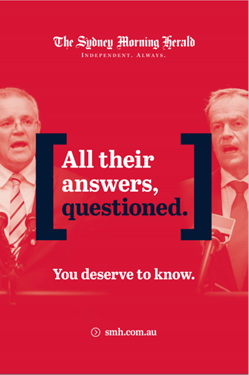 Using the same design as the first phase of the campaign, the election-themed campaign uses imagery to make the next iteration clear, with Scott Morrison and Bill Shorten leading the campaign. The team will also create breaking video new, extra episodes of its weekly podcast Please Explain and a live blog running on major campaign days. With a date set for the federal election, brands and agencies across the industry have already released their plans on how they will be contributing to the event. From building the “ideal candidate” to tracking the top political parties, this year people are thinking of creative ways to get involved. As for the politicians themselves, AdNews is tracking how much they spend on advertising across TV, radio and print. The biggest spender is Clive Palmer’s United Australia Party, last week passing the $30 million mark.